The MIDI Manufacturers Association (MMA) has released a Specification for use of TRS Connectors with MIDI Devices. It is available for free download by MIDI Association members. 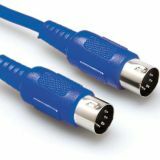 The document defines how to wire "TRS" (tip-ring-sleeve) connectors for use with MIDI devices, and describes the necessary device circuitry and cable specifications to support MIDI communication over the TRS connection. The inclination towards smaller hardware devices has made it increasingly difficult to make use of DIN connectors for MIDI In/Out in the past few years. Many manufacturers have chosen to use 2.5mm or 3.5mm "TRS" connectors instead. But since there was no specification for wiring a TRS MIDI connection, the situation exists where two devices may not have chosen the same wiring scheme, so compatibility between devices is not known. By specifying the pin-out for the TRS connection, and also the connectors for the adapter cable, we can ensure greater interoperability between TRS and DIN-MIDI devices.